Client is the leading and prestigious law school in the USA. It is one of the popular schools in the United States for earning law degrees and running a support program California Bar exams. With an aim to help students pursuing the right programs with a right approach and practice, the organization focuses on students’ success. The client required Salesforce integration into existing the application with effective management of student application approval and financial functionalities. There was a lack of integration and a lengthy procedure was used to dump data from MS-SQL database to Salesforce. MS-Access form was developed to import data from TLS database into sales-force using CSV Files. Due to this, the client needs to create manual CSV files for each table data insert in Salesforce table. For example, if there is a need to import data into 10 Salesforce customized table, then there is a need to create 10 CSV files. Furthermore, the manual field mapping needed between CSV files and tables. Two-way bidirectional data synchronization between MS SQL and Salesforce. With automated integration, when a student submits an application via the web it will be integrated into Salesforce at the same time. The necessary data validation and auto-field mapping was a part of the solution. Data validation includes field data type, field length, and the primary-foreign key relationship between parent and child tables. To perform integration, multiple Salesforce APIs options were available. With the client needs, the Salesforce web service SOAP API was used (WSDL-SOAP API connector) which was more suitable for Salesforce enterprise version. The web application is connected to MS-SQL using JDBC connect and get require data to import into Salesforce. 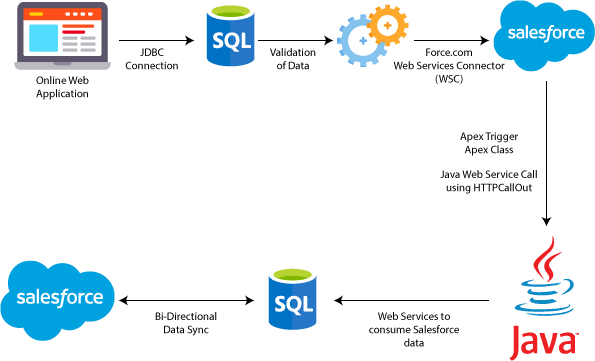 JAVA uses Salesforce SOAP API using WSDL connector to validate data and if all found OK, it will load data into Salesforce customized tables.